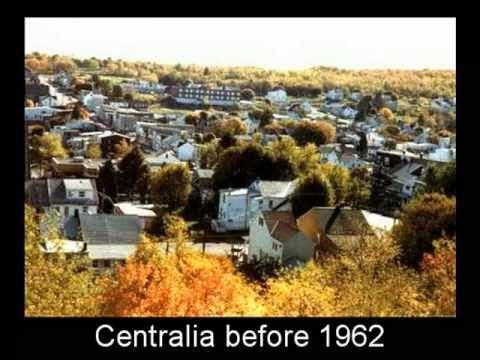 In its heyday, much like any mining town, Centralia had a modest population of about 3,000 people, comprised of coal miners and their families. A tourist's visit today could nearly double the population. There are 10 people who live there...precariously. 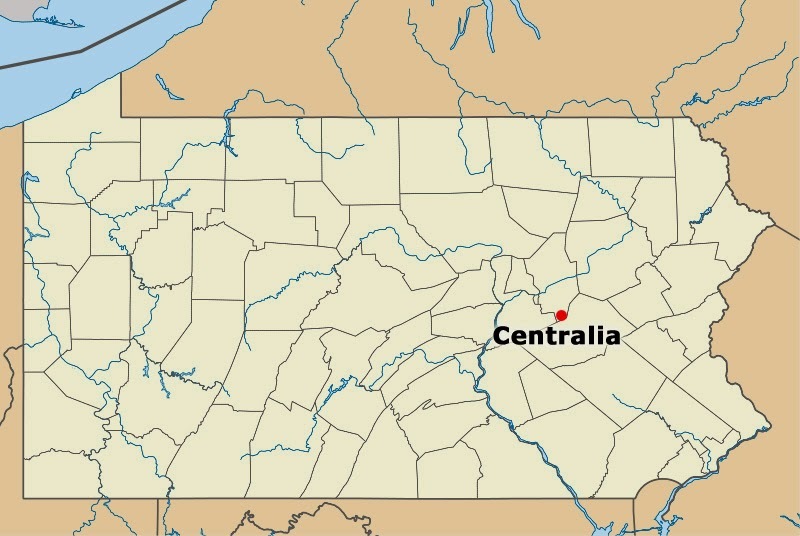 The United States Census Bureau officially recognizes the Lehigh Valley (in which Centralia is located) as the Allentown-Bethlehem-Easton Metropolitan Area. 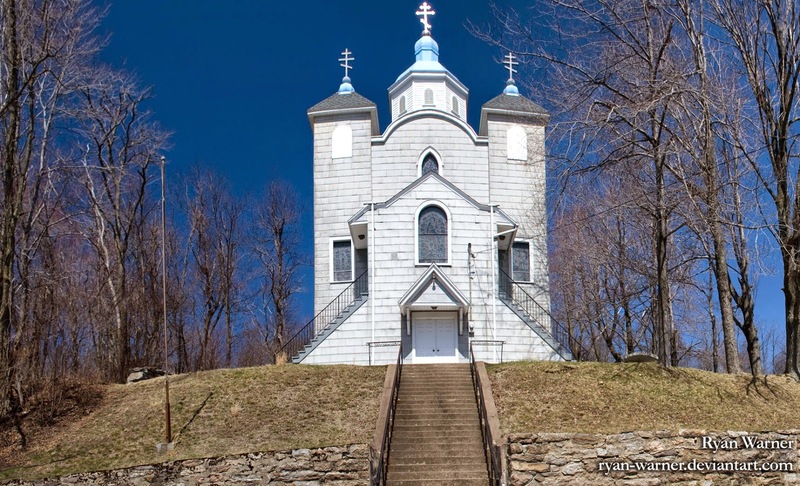 If you weren't familiar with the area before, perhaps you recognize the names Allentown and Bethlehem, which are historically famous for their mining operations and steel production. 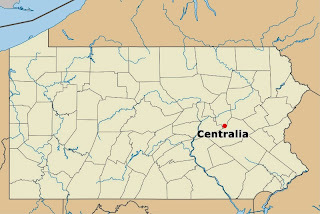 Centralia was once part of the Lehigh Valley powerhouse. By 1962, mining operations were so successful that trash and mining waste had begun to accumulate. As there was no designated dump site, mining companies would fill old strip mines with trash. At one point there were eight illegitimate dump sites around the city, and Pennsylvania lawmakers had already learned the painful correlation between landfills and mine fires. A precautionary law passed in 1956 required that all strip mine landfills be inspected regularly as it was not uncommon for new mines to have perforated the walls of old mines. Upon the regulatory inspection of the proposed landfill site, an inspector for the Dept. of Mines and Mineral Industries noticed holes in the wall and floor of the mine site and informed Council members that the site would have to be cleared and filled with an incombustible material before the city could officially deposit trash there. The proposed site, however, already had trash in it, and the city would have to remove it before they could meet the regulatory requirements. The meeting minutes do not disclose the proposed disposal procedure, but historians' best guesses speculate that Council had agreed to burn the trash rather than remove it (since that is exactly what they did), and that such discussion was omitted from the minutes because Pennsylvania state law prohibited dump fires...and as Centralia learned the hard way, some laws are there for good reason. On May 27, Centralia council hired five members of the volunteer fire department and lit the match. After allowing some of the trash to burn, the flames were doused and the fire was assumed to be out. 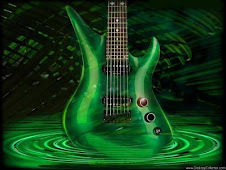 However, two days later, another burst of flames erupted from the pit. These flames, too, were doused. Given the scale of the burn, a smaller eruption could be considered normal and no big deal as perhaps the fire just hadn't been completely put out. The pit seemed under control until a week later when fires once again erupted. Again the fires were put down,and this time the fire department sent in a bulldozer to stir up the garbage, presuming that the cause was smoldering, underlying waste. Once the pit was churned, however, workmen found a hole in the floor of the pit that intersected another mine shaft underneath. The presence of trash had concealed the hole. The fire department wetted the trash and killed the flames once again, but the fire would not stop. While there was no open flame at the moment, the fire continued to smolder out of control filling the area with foul odors and noxious fumes. Residents filed complaints with the borough, and eventually more equipment was brought in to determine the cause of the belligerent burning. Detection devices found high levels of carbon monoxide, which was indicative of a mine fire. Despite bids to dig the area and clear the fire out of the mine shafts, on August 6, lethal levels of carbon monoxide were detected, as the fire had spread to network of mines below, igniting a large vein of anthracite coal that could not be extinguished, and all Centralia area mines were permanently closed. For the next 20 years, numerous futile attempts were made to extinguish the fire. 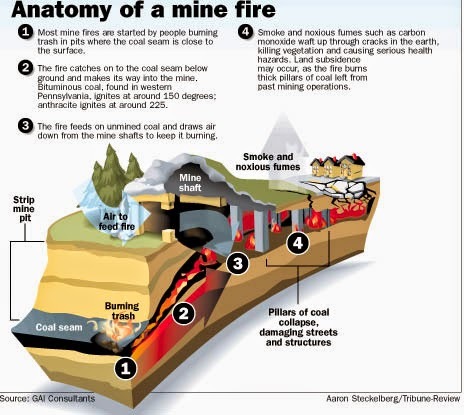 Not only were the deadly fumes a threat to residents, but the ground beneath their houses and their feet became highly unstable as coal burned away leaving fissures and causing the collapse of surrounding rock. Sinkholes appeared overnight swallowing houses and sometimes even people. Between the constant belching of toxic gases and the unstable foundation below them, the town of Centralia, PA became unlivable, and most of the residents moved away under the Federal relocation program. Experts say there is enough coal down there for the fire to burn freely for another 250 years. All lands and properties have since been seized by the State through eminent domain, and in 1992 the town's ZIP code was officially revoked. 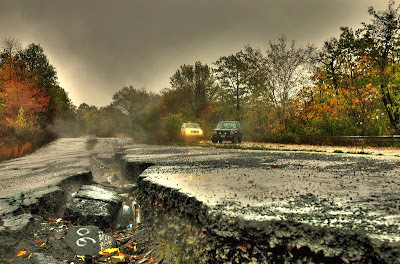 Bim Skala Bim isn't the only band to make something out of the nothing that is left of Centralia, PA. 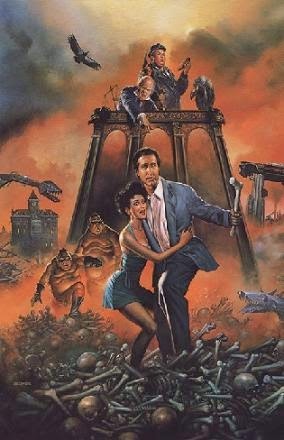 The 1991 movie "Nothing But Trouble" takes a stab at it in a comedy that's almost as bad as the fire itself, starring Chevy Chase, Dan Akroyd, Demi Moore, and featuring hip hop artists Digital Underground (including Tupac's theatrical debut) in a burned out, Rust Belt town called Valkenvania that collapses into a heap of underground flames. It's also the inspiration for the film adaptation of the video game "Silent Hill". 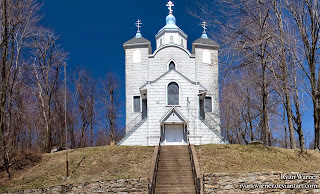 Filmmakers made several trips to Centralia to draw up the set, the most iconic centerpiece, of course, being the church.